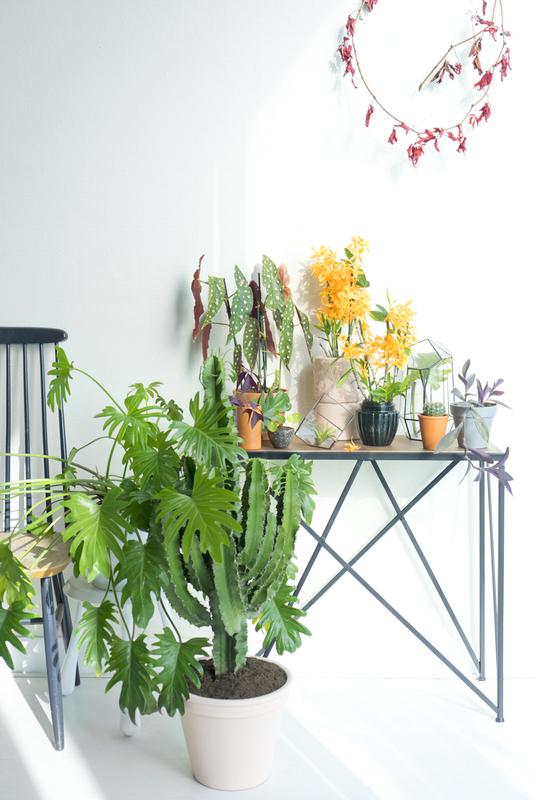 While outside it is getting gray and gloomy, the ‘Houseplant of the Month November’ is adding a dash of exotic beauty and color to the home. 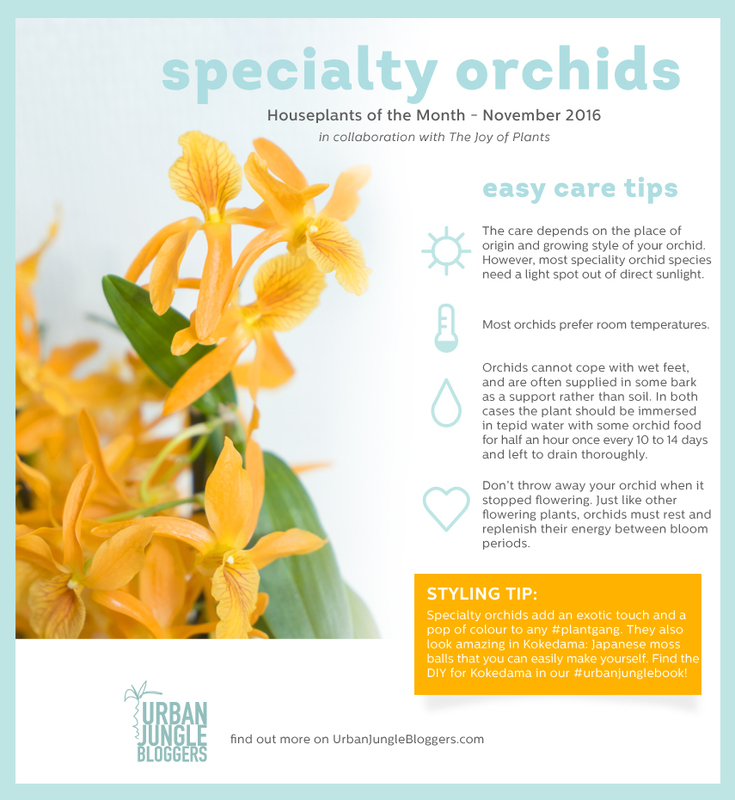 The month of November is dedicated to specialty orchids. Not the regular orchids you know from the supermarket and garden center. 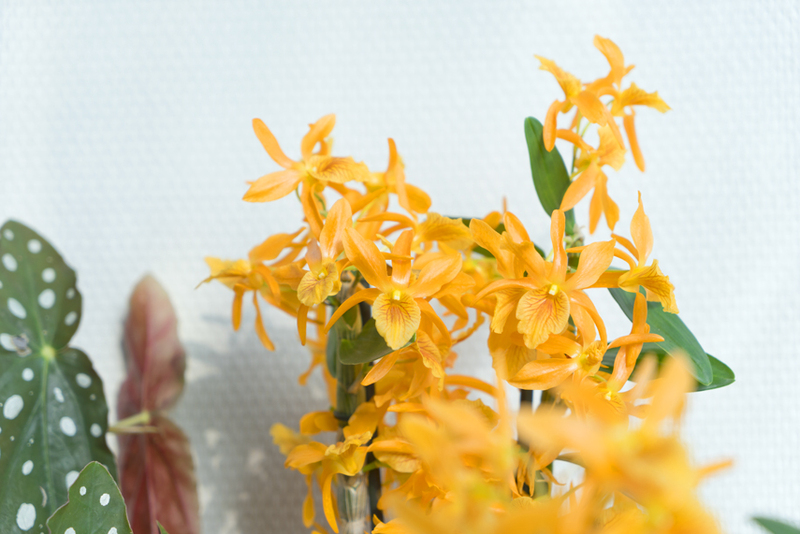 This month we want to highlight the beauty of outstanding, special orchid varieties. 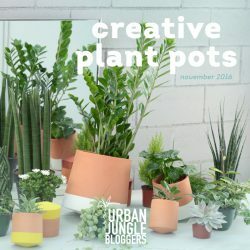 The unusual shapes of these houseplants with slim stems, heavy crowns, and bizarre tendrils create a visual focus point in any home. 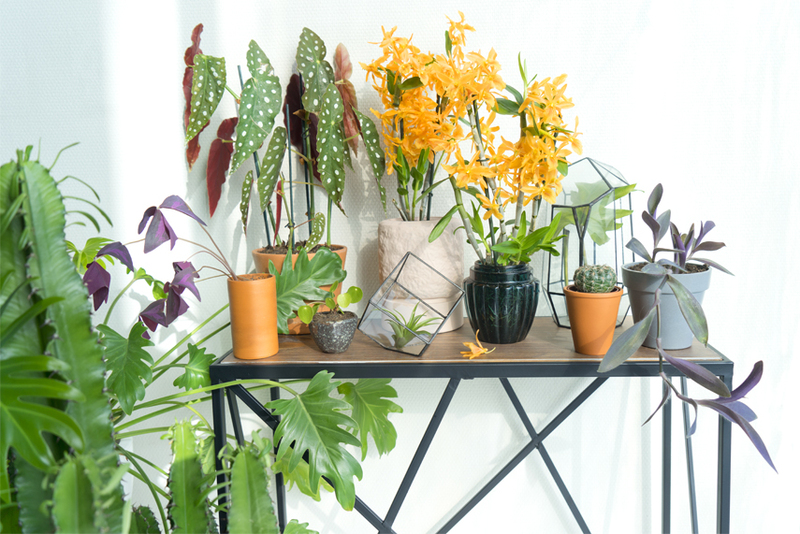 Paired with other plants, terrariums, mirrors and crystals, the specialty orchids add a real dash of mysterious beauty and exotic vibes to interiors. 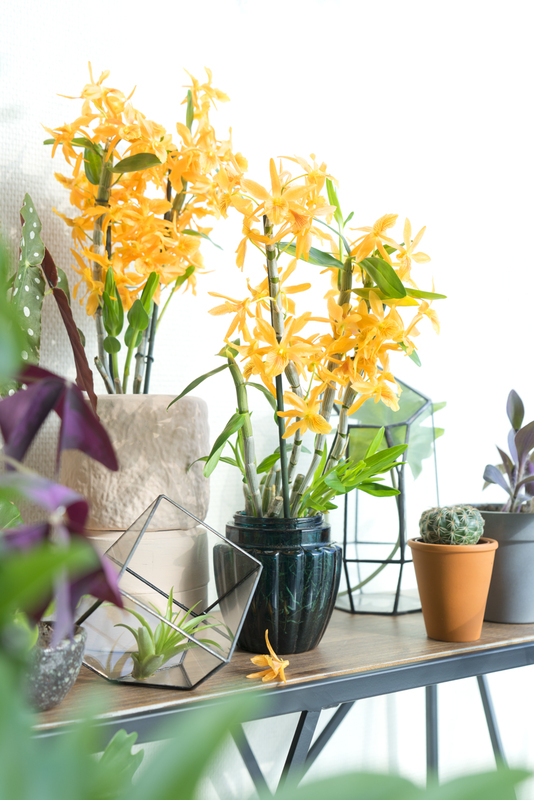 Today we want to introduce six specialty orchids to you: Cymbidium, Paphiopedilum, Cattleya, Zygopetalum, Brassia and Dendrobium nobilé. As exotic as the names are, one thing they have all in common: exceptional beauty. The Cymbidium stems from the tropical rainforests of the Himalaya and does not resemble a classic orchid at all. The orchid is rich in grassy foliage with one or more branches on which a long series of beautiful cup-shaped flowers appear. The flowers can be yellow, green, orange or cream. The Paphiopedilum is a native from southeast Asia and has tall green leaves, which make this orchid attractive even without flowers. The flowers however are very impressive too: russet, yellow or green with beautiful markings and an elegant shape. The Paphiopedilum is a shade orchid and thus tolerates partial shade, but not full sun. The Cattleya is a tropical orchid which only occurs in South and Central America. This outstanding orchid features a tuber from which only a few thick leaves emerge. The flowers are usually 10 to 20 cm in diameter, and range in colour from white through yellow, orange, green, pink, purple and beautiful pastels. Some have a beautiful fragrance, which has earned Cattleya the nickname ‘Queen of the Orchids’. This orchid prefers a humid environment so place it on a tray with wet pebbles to increase the humidity around the plant. The Zygopetalum grows on tree stumps and rocks and on the soil amongst the leaves in South America. The flowers are burgundy, green and brown and sometimes almost blue; some varieties have a sweet fragrance. As with most orchids, after flowering cut the flower stem off at the bottom. The orchid will produce more flowers on a new shoot. That does require patience: it can take 8 to 12 months. The Brassia is referred to as ‘Dancing Lady’ in its native South America due to its delicate flowers which move when you pass by. It has curved stems with 10 to 15 greenish flowers with a diameter of 15 to 20 cm. The flowers themselves are spotted black and purple and the white lips have unusual green spots. This unearthly appearance makes Brassia a very eye-catching orchid which originates from the damp rainforests of Central and South America. The long train of flowers has earned it the nickname ‘spider orchid’. Despite its exotic appearance the beautifully scented Brassia is easy to keep in the living room. 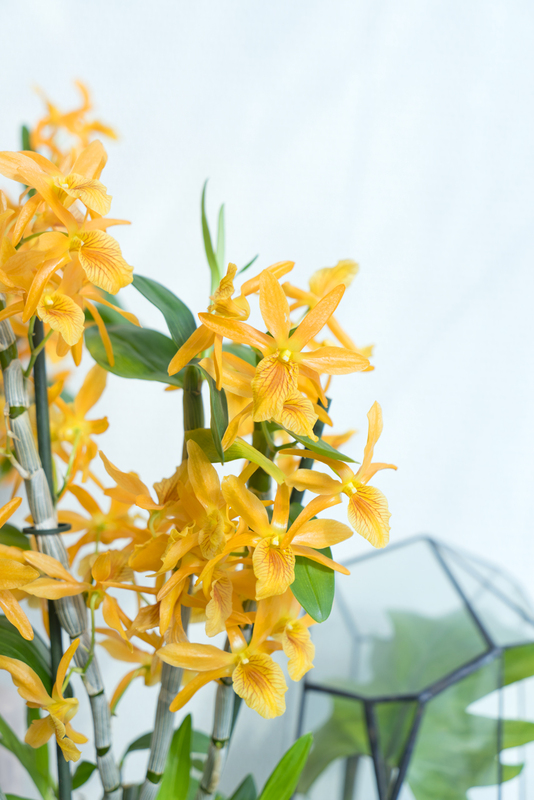 The Dendrobium nobilé distinguishes itself from other orchid species by the cluster of flowers which grows at the axil of each leaf (it is the orchid on our images in this blog post). The flowers give off a lovely scent. In the wild this orchid grows both in the cool mountains of the Himalayas, jungle of New Guinea and the desert of Australia, so it can easily cope with a living room climate. Dendrobium flowers for four months on average and is known for flowering again for anyone who can be patient for a couple of months. 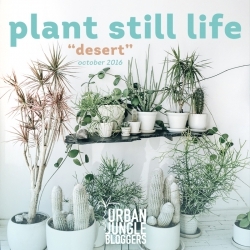 The name derives from Greek and translates to ‘Tree Life’ – which is based on its natural habitat as an epiphyte that grows on other trees.